… So for sixteen days we all had to bide time until the boy could be buried. It would be sixteen days before his body could, at last, be lowered into the uneasy, overturned earth, and all the while, he was taken apart and reassembled, both in organ and in character. Each day brought some new revelation about the placement of bullets, each day a new besmirching of his personality. During those weeks’ wait, his death spun out like shrapnel, dust, detritus, like tear gas and rivulets of milk, like whispers of revolt and like war cries. His passing meant too many things to strangers and had settled under their skin, left burns, begun to scab. It became hard to remember Mike-Mike in the madness, hard to recall the exact name of his college or his precise height and weight. We couldn’t quite tell each other the color of his eyes. None of us knew what could invariably make him laugh. Too many images loomed larger: law enforcement in riot gear, rifles trained on children, threats — nay, promises — of more murder and bodily harm at the hands of local police. We were so haunted we couldn’t remember that we’d never known the actual boy at all. When someone dies unjustly, all his journals are judged as unauthorized memoirs. Every article we pen about him is its own invasive autopsy. We learn too much, the intimate and the inconsequential: last few breakfasts, innermost fears. We read or overhear that he had been dreaming of bloodied bedsheets. In his last few fits of slumber, he could hear a bell of reckoning. He thought it tolled for friends, for relatives. He did not know it knelled for him. We learn all about the poorness of his high school, how for senior portraits, the graduating students had to circulate a single cap and gown. We learn mortifying, mystifying things. Injustices long swallowed rise up in our throats like bile till Mike Brown becomes a battle cry. But sometimes, when all is said and done, we realize we’ve learned nothing we should’ve. He was buried on a Monday and by the time it happened, he was cause, he was principle, a platform for voter’s registration, a morality play, an archetype, a cautionary tale. But only for the people who knew the clouds that could pass through his eyes when he worried, who remembered the day his squeaky voice dropped, whose thoughts of him toggled between more than convenience store and corpse… only they could truly mourn his simply as a boy. Their boy. 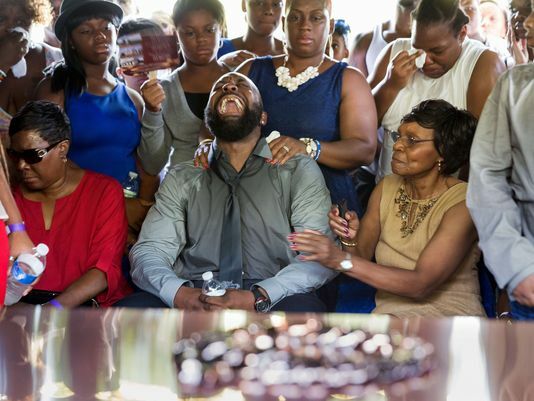 The family allowed us to mourn their boy, letting television cameras live-stream his funeral. They gave the press exclusive access to their grief. They implored us to understand the skin, the bone, and the murky, thoughtful, aspirational mind of their son. We tried. At least some of us tried. But it is hard enough to understand people we’ve met and near impossible to truly know a young man we may never have seen, had he not been riddled with bullets on a random summer afternoon. It had been difficult, then, not to co-opt him, difficult not to project onto him our own fears, our own sorrows. Because those boundaries were becoming so blurred, this final access rankled some and was welcomed by others. Some of us needed to watch his homegoing; others needed nothing so much as to look away. But in truth, from the time the boy’s body became public spectacle, lain bare for four hours on a sleepy street in Ferguson, we’d been given more access to him than he or his parents or any of us would ever have wanted. Michael Brown Sr. (center), surrounding by family at the grave site where his son was laid to rest. Like Mamie Till-Mobley before them, Lesley McSpadden and Michael Brown Sr. wanted the world to continuing seeing the injustice that what was done to their baby. I have always found it discordant to attend a funeral where the songs are uptempo and the attendees are rejoicing. I do not know how to call a funeral a homegoing or death a transition, though they are, of course, all of those things. What I want most when laying someone to rest is the space to sob as I recall him, the arms to hold me as I buckle, company of a great cloud of witnesses. But everyone needs different things in times of unthinkable sorrow, laughter as much as mourning, the catching of the Holy Ghost as much as a graveside howl. 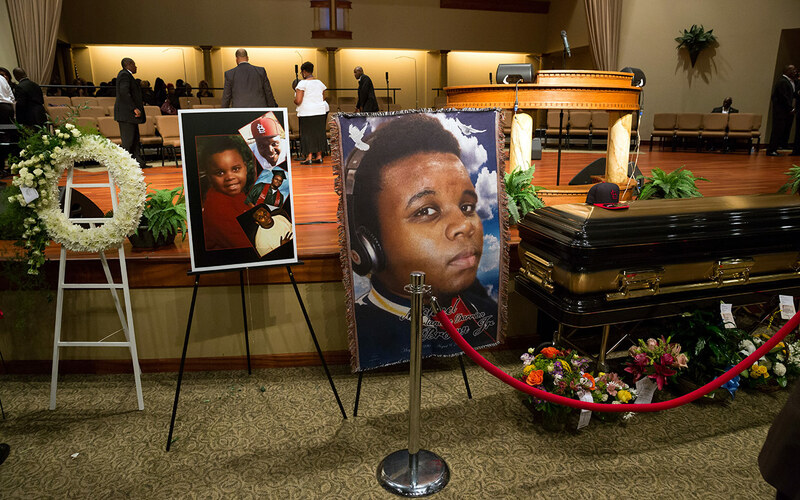 All I can hope is that, by letting us in, on Monday, as they have on every day since they lost their eldest son, the family and friends of Michael Brown Jr.’s had all that they needed. I hope that in the months and years to come, the cavern of that need will never be hollowed and always be filled.